Q: Can you cook over a fire log? A: Depends on the fire log. Firelogs we’ve reviewed so far. 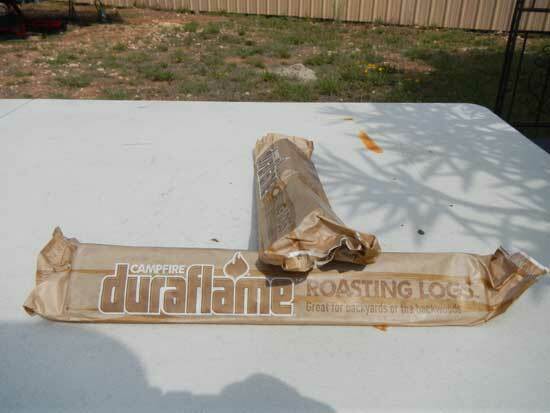 Duraflame Roasting Logs – Highly Recommended – Don’t expect a big fire, but they worked well for cooking. 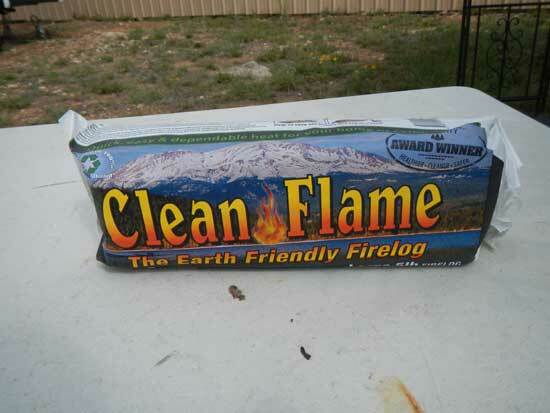 Cleanflame Firelogs – Not Recommended – Too big of a fire for cooking, puts off a lot of paper ash and had a slight odor. 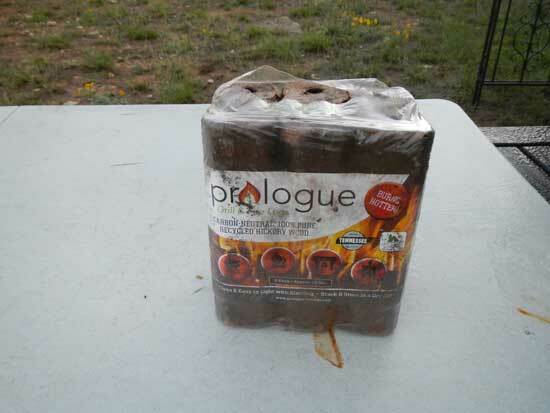 Prologue Grill and Firelogs – Hard to light, but tasty – These may be better suited as an additive to a fire for wood smoke flavor, but by themselves just don’t light and burn that well. You shouldn’t cook over most typical fire logs, such as a regular Duraflame Firelog. 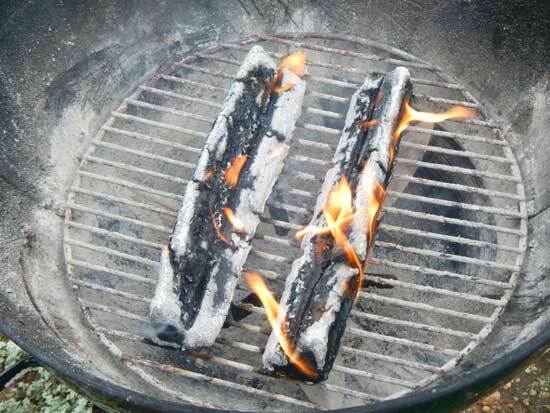 The residue off of the logs can add a funky flavor to your food, and since they generally produce only a flame and no coals, they aren’t really the best fire logs for cooking anyway. Remember that any fuel source you cook over becomes part of what you’re eating. A lot of the fire logs that you’ll find in the supermarket are made of sawdust and petroleum wax. When you burn them, some of that petroleum wax doesn’t completely burn off, but is instead released into the air as a vapor that can settle onto your food, leaving noxious flavors that could potentially even make you sick. There are some fire logs out there that are designed for cooking, or purport to be suitable for cooking. We’ve decided to give them a try to see how well they perform. In testing each fire log, we burned them in a Weber Kettle Grill, all with the same vent settings. For the flavor test, we used regular Oscar Meyer wieners. The mild flavor of the wieners helped us to detect any odd flavors and odors. Burn Time: The flames lasted about an hour and a half and left behind coals that continued to smolder. Although the instructions stated the fire logs would burn about two hours, ours smoldered for over four hours. They left a small amount of ash after they finally burned out. Burn Type: Low flames for a period of time and then coals. Fairly good for cooking over. Difficulty in lighting: Fairly easy. The instructions recommend lighting the paper at the ends of the log. One log lit properly. On the other firelog, the paper burned off on the ends and went out. We used a knife to score the ends of the log and finally got it re-lit. Flavor: Light charcoal flavor. The instructions indicated that you should let the fire logs burn down for 45 minutes to an hour prior to cooking (which we followed). Pros: Good low flame and coals to cook over. Since each individual package comes with 4 smaller logs inside, it can be taken apart and fewer logs packed for lighter weight. Cons: Overall, we were very happy with these firelogs. We weren’t too happy with the long period that the logs smoldered, but that was only a minor issue. Just be sure to have a water source nearby to douse your flames before leaving your campsite. Burn Time: A little over three hours (the package called for three hours on the large logs). 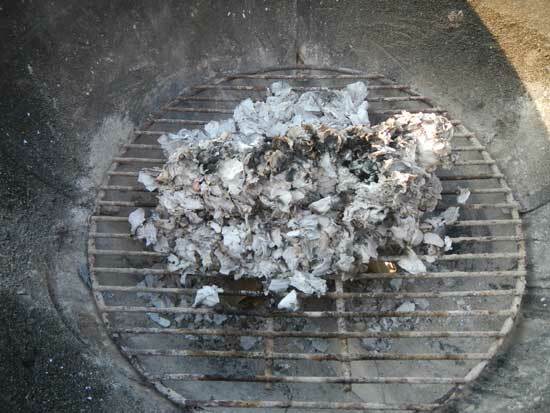 Left a large amount of paper ash after it burned out (the kind that blows all over the place at the slightest breeze). Burn Type: Mostly a large fire, although it took some time to build up. The fire stays large until it burns itself out. Not ideal for cooking over. Difficulty in lighting: Easy to light. Flavor: Neutral flavor, although the wieners had a slight odor. Pros: Okay for roasting marshmallows. Cons: The constant large flame is inappropriate for most cooking, unless all you want to do is roast marshmallows. Since the logs are made from compressed wax covered cardboard, it creates a lot of paper ash, which will blow around at the slightest breeze. Odd odor on the food cooked over it (we prefer our food to smell like food). Burn Time: More than three hours. May be shorter, depending on how you build your fire. Burn Type: Similar to a regular wood fire. Supposed to burn hotter than regular wood (not tested). Difficulty in lighting: Very difficult. The instructions let you know you’ll need some kindling. Unfortunately, for the test, I didn’t have anything I could use. I had to cheat with some charcoal lighter fluid. You’ll need plenty of kindling to get it going and to keep it going. Flavor: Excellent hickory flavor. These fire logs are nothing but compressed hickory sawdust so, if you’re looking for a natural wood fire with no additives, its the way to go. Pros: Excellent flavor, no unnatural additives. Cons: Heavy for their size. Difficult to light and maintain your fire. These are definitely not the type of fire logs that you can just light by themselves and walk away from. 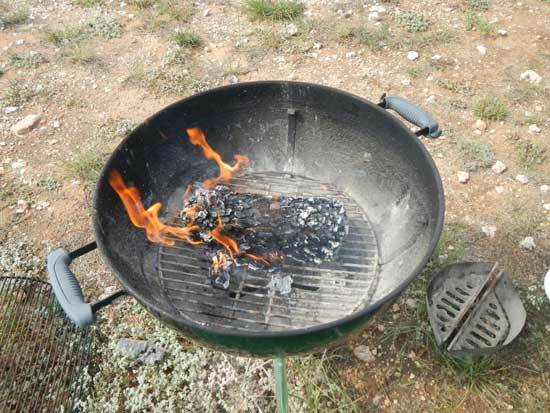 While we don’t believe that any of the fire logs are better than cooking over natural wood coals, they are handy to have in some parks where wood fires are prohibited. If you ask nicely, they’ll sometimes let you use firelogs in the fire-rings at your campsite since they don’t put off sparks like a typical wood fire. Generally, if they’ll allow charcoal fires, they’ll allow fire logs. Having a couple of fire logs on-hand (that you can cook over) will make your camping trip much easier if there’s a lack of available firewood, or it’s all wet. 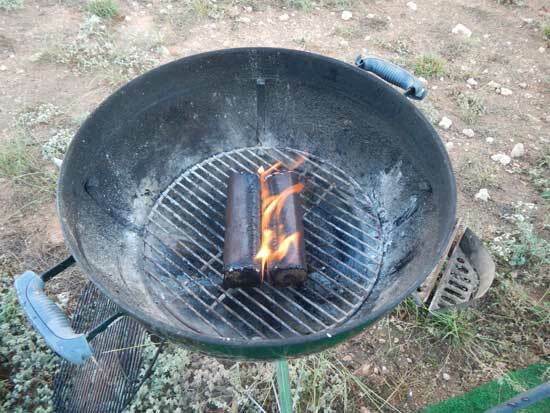 We usually keep a couple of the Duraflame Roasting Logs with our camping gear just in case. They’re a lot easier than carrying around a bag of charcoal. The thing to remember, is that for optimal cooking conditions, a large fire doesn’t work that well. Don’t expect these firelogs to put out a huge flame like a typical fire log would. If it did, your food would be burned on the outside and raw on the inside. Do you know another brand of firelogs out there that are safe to cook over? Let us know in the comments section. We’d like to test it out. What about “pine mountain” fire logs carried by Walmart? Package says made of bio materials,clean burning, and can be used in fire pits and campfires. BLittle. We’ll look into it further, but right now I would say no. They appear to use petroleum wax as an accelerant, which can transfer onto your food as you cook it. It is correct, but it doesn’t address this specific product. In their section on what ingredients are included in their firelogs, it tells readers to contact their Consumer Affairs department for the material safety data sheets. I would guess, since they aren’t publicizing what’s in em, that you probably don’t want to know. I wouldn’t recommend cooking over them.